kt literary » Blog Archive » SOLD!!! Congratulations to Michael J. Martinez! SOLD!!! Congratulations to Michael J. Martinez! Please help us congratulate Michael J. Martinez on his big news today!! New York (Oct. 6, 2015) – Night Shade Books, an imprint of Skyhorse Publishing, announced today it has acquired three new novels – the first in the new MAJESTIC-12 series of paranormal Cold War thrillers – from Michael J. Martinez, author of the critically acclaimed Daedalus trilogy. The first MAJESTIC-12 novel, titled MJ-12: INCEPTION will be Night Shade Books’ lead title for Fall 2016, marking the beginning of a brand new historical spy-fi series following the shadowy trail of a team of paranormally empowered agents working on behalf of a top-secret government program. MJ-12: INCEPTION features the formation of the shadowy MAJESTIC-12 organization within the U.S. intelligence community to take advantage of people displaying mysterious powers. But whereas MAJESTIC-12 has long been a conspiracy theory for UFOlogists, Martinez is taking things in a very different direction. 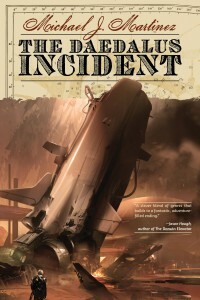 His short fiction has been published online by Paizo and in the Cthulhu Fhtagn! anthology released this summer by Word Horde. His newest short story will be published this fall in Unidentified Funny Objects 4, alongside stories by Neil Gaiman, George R.R. Martin, Piers Anthony and Esther Freisner. ← THE NEW GUY gets his first blurb!